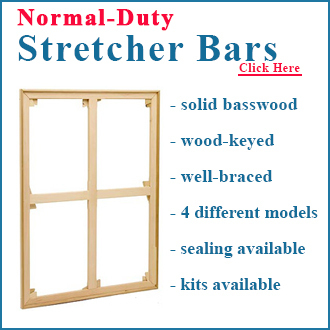 For fifty years we have crafted the finest wooden stretcher bars in standard and custom sizes. 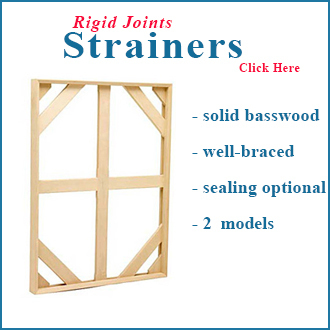 We make several styles each of traditional wood keyed stretchers, expansion bolt (mechanical) stretchers, and strainers. All basswood construction- a light weight, straight and ph neutral hard wood sustainably grown in the Great Lakes region of the U.S. and Canada. 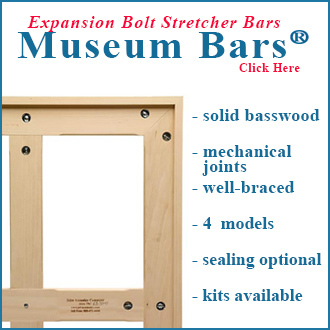 For the finest control, use our Museum Bars expansion bolt stretchers with precision mechanical joints incorporating copper plated steel dowels for perfect joint alignment at corners and braces. The mechanical joint allows precision control of expansion and contraction. Various depths and edge treatment options. Our traditional wood keyed stretchers come in Normal Duty and Heay Duty, both in a variety of styles, depths and edge treatments. Wooden keyed joints allow independent expansion of each side of a corner joint. We make our own wooden keys, too. If you have us stretch fabric or your painting on our stretchers, we will ship it in a re-usable light weight shipping crate, made in-house to custom fit your work. 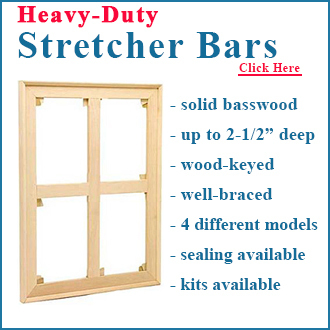 Below are detailed sections regarding each style of stretcher. At the bottom of those pages are standard sizes which you can add to your cart.